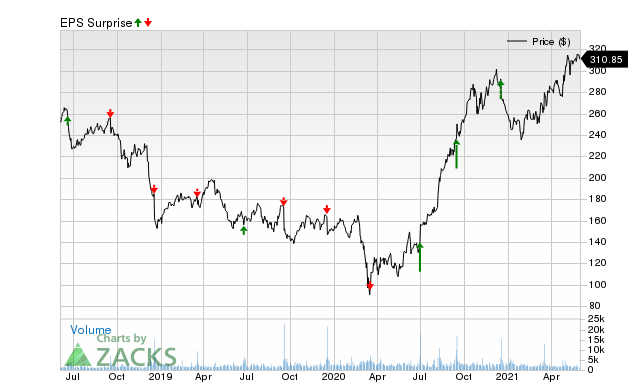 If you are looking for a stock that has a solid history of beating earnings estimates and is in a good position to maintain the trend in its next quarterly report, you should consider FedEx (FDX). This company, which is in the Zacks Transportation – Air Freight and Cargo industry, shows potential for another earnings beat. This package delivery company has seen a nice streak of beating earnings estimates, especially when looking at the previous two reports. The average surprise for the last two quarters was 12.05%. For the most recent quarter, FedEx was expected to post earnings of $5.72 per share, but it reported $5.91 per share instead, representing a surprise of 3.32%. For the previous quarter, the consensus estimate was $3.08 per share, while it actually produced $3.72 per share, a surprise of 20.78%. With this earnings history in mind, recent estimates have been moving higher for FedEx. In fact, the Zacks Earnings ESP (Expected Surprise Prediction) for the company is positive, which is a great sign of an earnings beat, especially when you combine this metric with its nice Zacks Rank. FedEx has an Earnings ESP of +0.45% at the moment, suggesting that analysts have grown bullish on its near-term earnings potential. When you combine this positive Earnings ESP with the stock’s Zacks Rank #3 (Hold), it shows that another beat is possibly around the corner. The company’s next earnings report is expected to be released on September 17, 2018.